PES stands for Physique Enhancing Supplements, and their latest pre workout Prolific blends well into their brand mission. PES declares that they willingly pass on quick formulations and mass marketing in order to bring truly effective, groundbreaking, and reliable supplements to the market. Yet, at the same time, they claim that many supplements are actually overloaded with unnecessary ingredients? Perhaps fillers yes, but overall we would classify the supplement landscape as an under-dosed one! So how does PES Prolific perform then? Here, we’re going to give PES Prolific our full review, and determine if Prolific is a superior product, or if it’s just marketed that way. PES Prolific Quick Review: PES claims their Prolific to be a cut above the rest – better quality, superior formulations, etc. But upon close inspection, it’s really no different than other clinical dose motivated pre workouts. In fact, it’s a bit overpriced and under-dosed in comparison. Other products aside, PES Prolific at 2 scoops will offer an intense energy and pump experience. One that all athletes will enjoy unless you’ve been spoiled by more advanced pre workout products. Category by category, here is how PES Prolific performs, rated on a scale from 1 to 10. Keep in mind that we’ve tried countless pre workouts, and may be more picky than you – so consider giving poor markers the benefit of the doubt if you basically like every pre workout. PES Prolific’s energy effects originate from caffeine and cognizin choline. Per single serving, Prolific delivers 160 mg caffeine and 125 mg choline. But at the ‘intended 2 scoop serving size’, you receive 320 mg caffeine and 250 mg choline. Cognizin is a great choice for this pre workout, and has been found to improve motor speed and attention span (1) (2). The strength Effects from this pre workout come primarily from the caffeine and a bit from the l-citrulline pump. This is typical, ranking as a 7/10 average. The primary endurance in Prolific is going to originate from the dicaffeine malate, which lasts longer than standard anhydrous (Prolific contains a blend of both). As well, some endurance can be extrapolated from the l-citrulline in this pre workout. However, it isn’t going to be as effective as a 6 gram dosage of l-citrulline malate – where the malate is directly used for energy by your muscles. 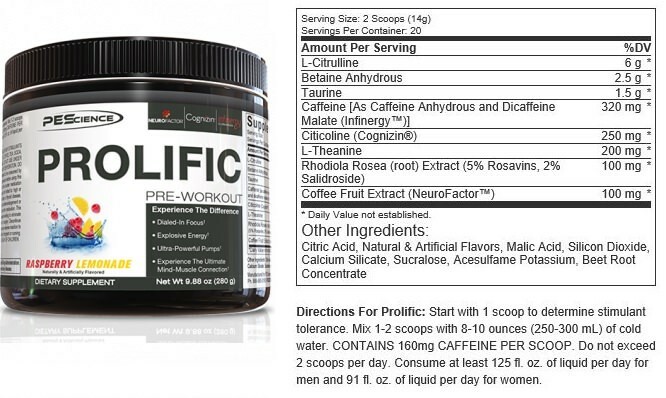 The average pre workout user is going to opt for Prolific’s advertised dosage, of 2 scoops. It’s funny how PES advertises 40 servings, yet then touts dosages based off the 2 scoop serving size which produces only 20 servings. But anyways, based on the two scoop serving size, crash is likely to be rougher than comparable pre workouts that include a larger l-theanine dosage to smooth the stims. We tried the Cotton Candy flavor of Prolific, and must say that it was quite delicious, both using small and large water quantities. If you don’t think this pre workout tastes good, then you are one picky person! However it is worth stating that Prolific uses both natural and artificial flavors plus the artificial sweetener sucralose. Something we didn’t expect based on the high standards touted by PES. PES has a reasonable formula that is dosed effectively at 2 scoops. However, in the pre workout realm, Prolific falls into the middle ground on formulation, and way on the high ground for price. After all, it’s over $40 for 20 servings at the optimal dosage. Basically, for the same price, you can get a whole lot more in a large-dose pre workout. Both ergogenic advantages and experience/stimulant enhancements. The most similar product to PES Prolific is Musclepharm Assault Black and C4 Ultimate, which are slightly less effective than this pre workout. Overall, PES provides a pre workout that combines 6 g L-Citrulline pump with 320 mg caffeine, by a brand that you can trust to give you a properly manufactured product. Besides this point, there isn’t a whole lot making Prolific too special of a product. It’s more a case of, well, who you want to buy it from: PES, or Cellucor, or Musclepharm. Note: If limited to these 3 brands, we would choose PES every single time. The above image is ingredient dosages based on a 2 scoop serving size. This cuts down your total servings to 20. 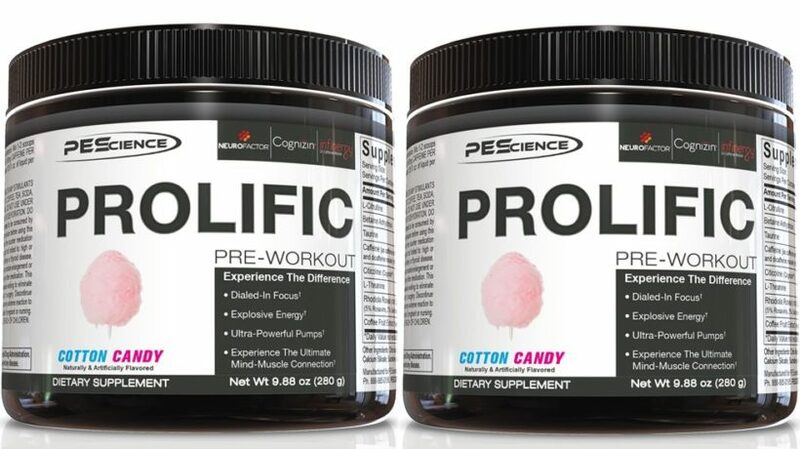 As a PES product, Prolific is a bridge between Alphamine which is a fat burning pre workout and the High Volume which is a stimulant free pre workout. For what they are though, all of these products are a bit on the over-priced side. Likewise, PES’s claim to slow releasing only the most effective products sounds nice… But from our experienced position in the supplement world we’re unsure exactly what they are taking credit for with that statement, based on these plain jane products. All we can say is, we hope PES continues to give the love and attention to their pre workouts as they do to ZMA supplements, carb blockers, and other products of which they are known for doing a job well done. Bottom line, for a pump and high caffeine pre workout, PES Prolific is going to do you right. Though, if you are like us and have tried quite a few Rockstar pre workouts… Then your acquired high-taste may make it less impressive and more of a, ‘well it works but why’d I pay $42 for it’ situation.